Posting for a friend: 52 thoroughbred horses need homes. Will go to Sugarcreek this Sat. for slaughter. Gentleman died his son wants nothing to do with them. Most broodmares are broke and some are in foal weanling, yearlings, 2 yrs and 3 yrs old most are gelded. FREE and papered. Friend of the deceased is trying to find homes. 440-463-4288 Barnesville. 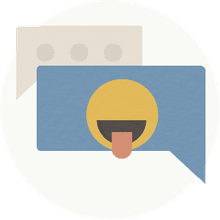 Please copy and paste this! Analysis: As often happens, a viral message which once upon a time had some truth to it continues to be posted, reposted, and re-reposted even though it has outlived its purpose -- to the point where now, three years down the road, it's simply false, irrelevant, and annoying. 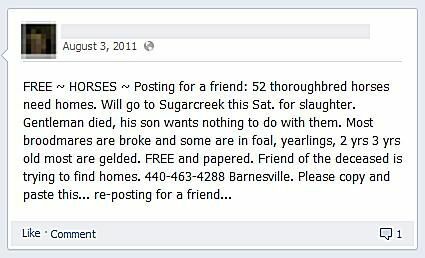 In January 2011 there were indeed 52 thoroughbred horses left homeless by a deceased owner in northeastern Ohio (though whether or not they were actually in danger of being "slaughtered" remains a matter of debate), but thanks in part to a timely plea by race horse enthusiast and Facebook member Lynn Boggs, all of those horses were successfully relocated within days. So her original posting was already out of date by the beginning of February, yet as of August 10, 2011, new and old versions of it were still replicating at the rate of several hundred repostings a day. Moral of the story: Good news doesn't travel as fast as bad news, or linger as long. Always check the facts before sharing! URGENT: 52 thoroughbred horses need homes in Joburg. Will go to Sugarcreek this Sat. for slaughter. Gentleman died and his son wants nothing to do with them. Most broodmares are broke and some are in foal, weaning, yearlings, 2yrs and 3yrs old most are gelded. FREE and papered. Friend of the deceased are trying to find homes. CONTACT: Chett Wallace in Rustenburg 084 274 8538. PLEASE PASS ON!